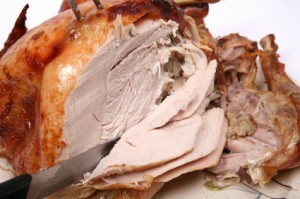 This is only for folks that actually have leftovers after their traditional, immense, and plentiful Thanksgiving feast. 1. Turkey breast, cornbread stuffing, jellied (yes canned cranberry sauce) cranberries, spicy brown mustard, and two slices of rye. 2. If you’re lucky enough to have the turkey carcass (sorry for the gruesome terminology) like I always do, you can make some yummy full-flavored turkey broth. Take that turkey carcass, roughly chopped carrots, celery, and onions along with a few bay leaves, peppercorns, and dried thyme, plunge it in a stock pot with cold water. Bring it up to a boil and then reduce it to a simmer. Simmer for at least 1 1/2 hours, strain and store. You can refrigerate it for up to two weeks or freeze for a couple of months. It’s great medicine for that cold or flu I really hope you don’t catch! 3. Flo’s Turkey Waldorf Salad: Diced turkey breast, diced celery, diced onions, diced apples, chopped walnuts, dijon mustard, mayo, apple cider vinegar, and tobasco sauce. So now when you come back from all your Black Friday shopping adventures (like I just did) or when you wake up from that tryptophanic coma, you’ll be all set with how to feed the family some extravagant turkey dishes…makeover style. Good luck, god speed, and Happy Holidays!! I featured this recipe for the first time at one of my Whole Foods Market, Engine 2, 28-Day Challenge classes in Henderson, NV. It was a hit because its amazing flavor that masked the fact it was an oil-less, fat-free, and cholesterol-free version of a traditional American salad. But potato salad is not only popular in America. Throughout the world, there are different versions of this boiled potato concoction that is enjoyed by all kinds of people. From America to Italy and Bulgaria to Brazil, there is a form of this “salad” in their cuisine. Potato salad varies in ingredients but will always have the same, basic ingredients: potatoes, an acid (usually vinegar), and a fat (usually mayonnaise or its counterpart, oil). Then, different accompaniments and garnishes are added to the trifecta. From string beans and red onions in Italy to bacon bits and hard-boiled eggs in the US, there are many things you can add to the potatoes to make it much more tasty. My version is definitely plant-strong and the healthiest way I serve potatoes in a salad. Mustard Dressing: 1/4 cup stoneground mustard, 1 garlic clove (minced), 3 tbsp white balsamic vinegar, 2 tbsp So Delicious plain coconut yogurt, 2 tbsp honey, 1 tsp fresh oregano (roughly chopped), 1 tsp fresh thyme (roughly chopped), and ground black pepper to taste. Directions: 1. Bring a medium pot of water to boil and preheat grill to HIGH. 2. Boil potatoes in water for 5-7 minutes or until potatoes are half-way cooked. 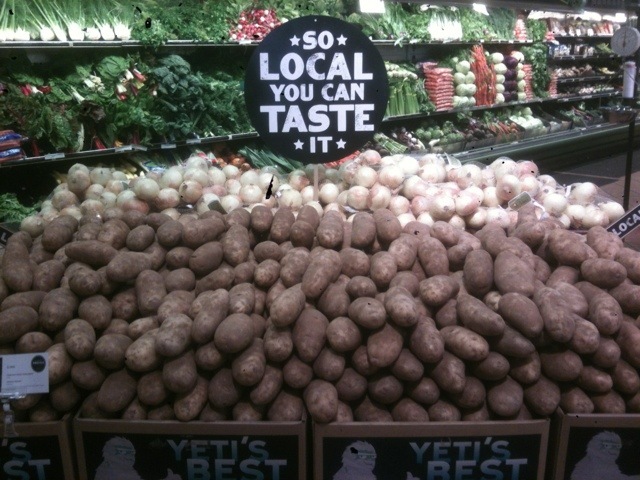 It will vary depending on the thickness of each potato. Drain from water and let chill in the fridge. 3. While potatoes are boiling and chilling, combine all the ingredients to make the dressing. Dressing will seem like it isn’t enough but it will be. Remember, we want to taste the ingredients not mask it with the dressing. 4. Once the potatoes are completely chilled, toss them in a bowl with the vegetable stock, turmeric and paprika. The vegtable stock is to lubricate the potatoes and cause the spices to stick. 5. Grill the potatoes on the hot grill, skin-side down first. Cook potatoes on all sides until nice and charred, or at least until you see nice grill marks. Grill the onions alongside the potatoes. Once all cooked, set aside to let vegetables cool down. 6. 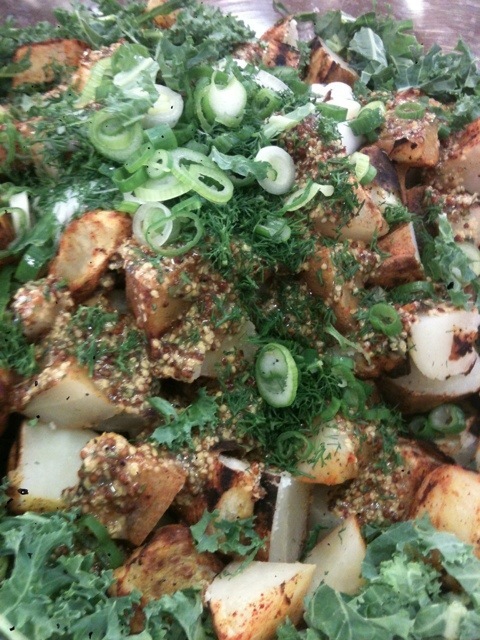 Toss the potatoes and onions with the dressing. Pour the dressing in small batches. You don’t want to overwhelm the salad with the dressing. Remember, its just for flavor, it isn’t the main ingredient. Haha! 7. Add the kale, green onions, and dill to the salad. Chill and enjoy! This salad is best served at room temperature. However, I have had it cold, straight out of the fridge and it was still yummy. If you feel the salad is a bit dry, just add a tbsp of the vinegar or the yogurt to revive the moist feel of the salad. The potatoes are a starch and constantly act as a sponge with liquid. Variations/Additions: I have made this by adding whatever other vegetable I had in my fridge that was going to go bad soon. Remember that my recipes are always just a base recipe. Alter it to your liking and taste, add what you like in a potato sald. Enjoy! Please post a comment on your variations so we can share with others what we like to do with our salads! 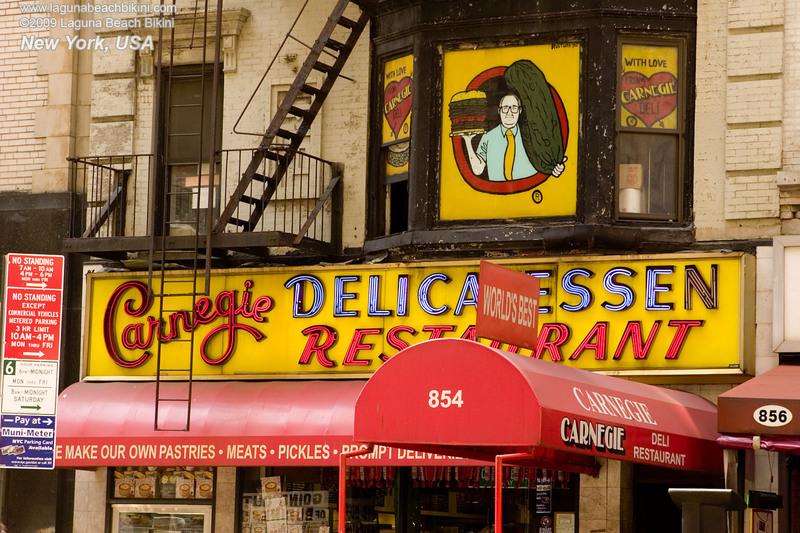 Most people who grew up in the tristate area have heard of the famous Carnegie Deli of NYC. 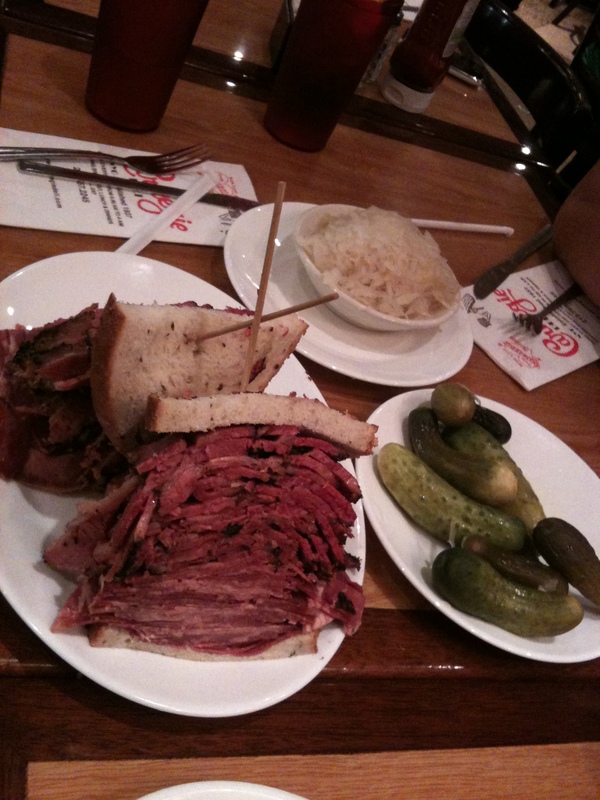 From the elite to the layman and the foodie to the hungry, the Carnegie Deli satisfies all! This recent trip to NYC was my very first time at this deli. Living in NJ for 20 years never even brought me to this sandwich haven. But after numerous times seeing on the Travel Channel in shows such as Bizarre Foods, No Reservations, and Man Vs Food. At every angle, I’ve been exposed to what amazing food the Carnegie Deli has to offer. Just around the corner from to Dream Hotel where we enjoyed the rooftop lounge, the bright lights of the deli called out to us. Walking in at 3AM, the deli was scattered with a handful of patrons and the restless servers and kitchen staff. You could tell we weren’t the only ones there to soak up all our alcohol. The walls were adorned with many picture of famous diners. It was like a “Who’s Who” for the Carnegie Deli. As we were seated, we were greeted by Desmarie, a twenty-year veteran server at the deli. She was the brightest soul in the room. I fell in love immediately. I actually kept telling her that I loved her and that I wanted to call her ‘Angel!’ she just nodded with approval. My best friends, dancers/instructors from the Dance With Me studio in SoHo of NYC, decided to share one of the mammoth sandwiches. They ordered a Hot Pastrami and Swiss served on rye with a side of thousand island dressing and coleslaw. They were a bit disappointed that the Swiss cheese wasn’t melted but hey, they don’t advertise, “Have It Your Way!” as you walk in! They both agreed that it was definitely tasty and did the right job for the night. They definitely made the right choice splitting one sandwich because they were only able to finish their own half. Questioning what I should order, I asked Desmarie for her opinion. Beef tongue? In an instant, she offered a sample of the thinly-sliced, full-flavored beef tongue. It was a winner. But since I felt just still a little squeamish, I ordered half Hot Pastrami and half Beef Tongue! With a side of sauerkraut, sour pickles, and the original Carnegie Deli mustard, I was all set! It was just what I expected. The warm, sweet, salty, and peppery flavor of the pastrami paired well with the beefy, almost bologna-style, flavor of the tongue. The pastrami helped somewhat mask the thought that you were eating tongue. Delicious nonetheless, this sandwich was everything I imagined. Oh, and if you don’t have it with the Carnegie mustard, you might as well not eat there at all! One of my friends commented that they liked Katz Deli pastrami a lot better. 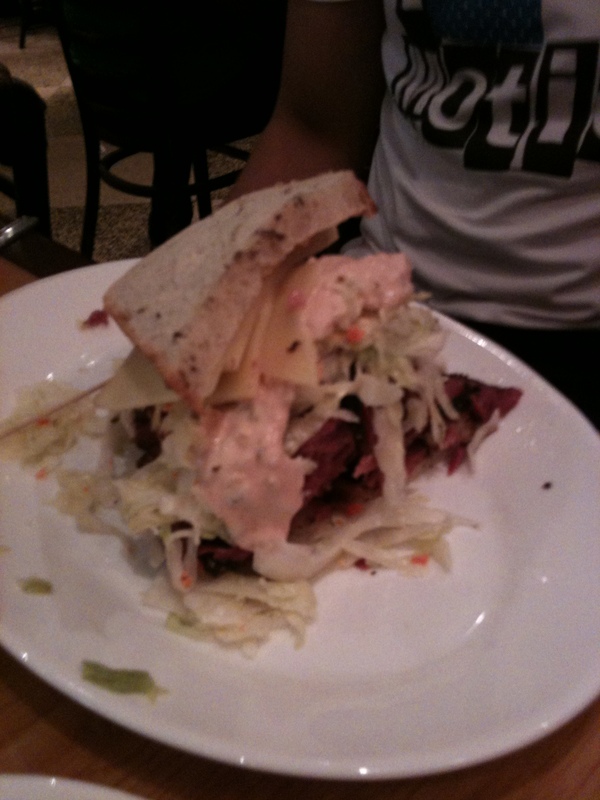 Now, I’ve never eaten at Katz and remember, this is my first time at the Carnegie Deli. But all it did was give me a reason to visit Katz! Have you eaten at both places? I want to hear your opinion. Leave a message here and tell me if it’s worth it to visit Katz Deli or keep to Desmarie’s loving attitude at the Carnegie Deli!